Did you find enough opportunities to support your career? If you did not find the one, choose Canada, it is one of the leading nations for your bright career. The country provides immense opportunities to develop your career with permanent residency status. 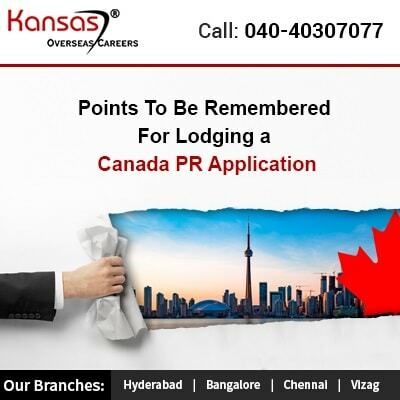 The Express Entry and the Provincial Nominee Programs are the most common pathways to choose for the candidates aiming Canada PR status. Hence, to experience an easier way of immigration, it is better to be well prepared with all the needed requirements. What are the information’s or submissions needed for the application? Need of identifying the eligible Program or Programs: Since, there are a range of categories to choose from, such as few are point-based; few are based on first-come, first-serve; few need sponsorship, and few remain open to submit. Hence, the interested candidates need to select the best program based on their eligibility & requirement. Consulting an Immigration consultant: The process of choosing a program for Canada PR can be a bit confusing. So, assistance from immigration consultant can provide the best guidance Canadian immigration. Preparation of Needed Documentation: The Canada immigration process requires a range of documents during its each stage of the process. Also, delay in submitting these can lead to slow application launch. Therefore, it is better to be well prepared with the needed documents. Re-verification of the Documents: It is very important that the candidates submit their exact and required documents during the immigration process. It is mandatory for the applicant to read each and every set of information and instruction. Need of submitting accurate information: All the submitted documents have to be original because, if any documents are proved as fake can make your profile removed from the Express Entry application process. Should be able to track the document’s expiration: It is best to maintain a track of the documents submitted along with their expiration dates. The documents include Passport, background checks, bank statements, language test results, medical assessment, work/study permit and more. Need of informing any change for the IRCC: If there are any changes such as the arrival of a new-born child, have got married, change in address, increase in education or any other changes related to their application, then the candidates have to make it updated to the IRCC. The Canadian Permanent Residency is the most privileging status for the candidates aiming for overseas opportunities. Express Entry and Provincial Nominee Programs are the immigration processes for availing Canadian Permanent Residency.